You’re sleeping, and suddenly a rhythmic sound of sticks comes out of nowhere. It’s getting closer to you as you listen to it more and more. You can’t help but think it’s creepy. No, its not a cheap ghost story I’m gonna tell. It’s merely a way as to how night noodle soup is sold here in Cambodia. 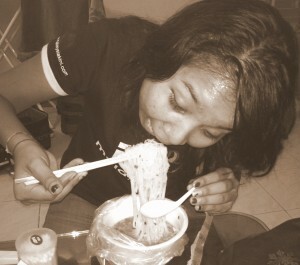 Night rice noodle, called in Khmer as “Kuy Teav Pok Pak“ is sold between 4pm and 2am — at very few blocks in Phnom Penh. I certainly have no idea why the seller finishes selling it very early in the morning. But one thing for sure is that they don’t sell it at a stall or their home but with a cart loaded with noodle and soup, they walk from one block to another. 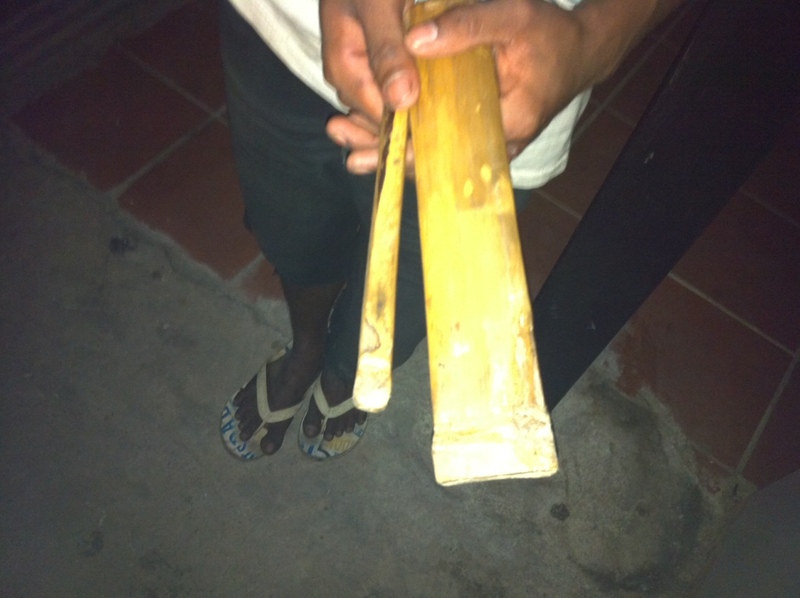 We call it Pok Pak, maybe because of the sound which sellers make by hitting two bamboo bars, walking through a village or town. It usually involves two dudes — one pushes the cart, and the other becomes a musician. I heard from my mother who lived through the Khmer Rouge regime that back to Sangkumreasniyum regime (when former king Sihanouk ruled), Cambodians, young or old, liked having rice noodle soup very late at night. Really? Why can’t they have it during the day? Teehee. My mother asserted that it’s always been like that since the past. Ching said that he's 21 years old this year, and sells noodles from 4pm to 2am. Also, I wonder if the boy has been scolded by people whom he can wake up by his bamboo bars. Now that I’ve heard of it a lot, I, however, began to think it’s quite a pleasant rhythm. (I wish I could convert the audio I recorded into an mp3 file) T__T Who could help me here? Thank you Kounila for sharing this lovely story of Phnom-Penh’s night life. Never had it, never heard it. Maybe I live in the wrong part of the city ? Thank you very much for this nice little post. I like you gradually brought us into the story. The introduction is pretty good and make me want to read more even though I am familiar with the story. Great job on that. Anyway, I notice a little typo. Above the bamboo picture, i think you mean 2am rather than 2pm. Not a big deal. When you said you recorded the audio, but you could not convert to mp3. Do you mean that you recorded it with cassette or you recorded it mentally? Most recorder are already saving in mp3 format. Can you clarify that? Sorry that i am being little over-analyzed, but i am just curious. Maybe it’s a good way to start a discussion. To answer the question “who eats Kuy Teav Pok Pak at night?”, I have some friends who drink in the evening and have to eat at night in order to sleep well. thankz keo for visiting indonesia on On|Off id. i see u in breakout sesion, so smart and beautifull. keep writing & feel free to express yourself. btw i like u use “batik” , u know batik? indonesian traditional dresses. @Davuth: thanks, dude! Won’t eat too much! @Seak Hong: thank you for reading it! @Pascal: thanks for reading it! =D I’ll show you around when you come back to PP. @Rattanak: thanks for the correction. @Yecuzsulla: thank you! Did we meet?